As I sat and listened to the Easter sermon, I really listened. The words of our pastor resonated with me and struck me in a way a sermon has not in a long time. Perhaps it was the surprise that we were not going on the Easter story the way so many Easter sermons have gone before. No, this year we focused on doubt. I'm quite certain that I have not heard the Easter story told with the focus on Thomas' doubt. But there it was, one of the faithful 12 in doubt. I admit, I have doubted so much in the past 12 months. I confess there have been times I doubted whether changing jobs, buying a house, getting married and raising E was my chosen path. I have doubted I could press on during sleepless nights and seemingly endless days. I've doubted my husband's ability to deal with all the changes he has endured in the past year and a half. I cannot count the number of hours I have sat in my office and doubted my ability to "do it all" and "keep it together." Those hours do not even count the ones spent pondering whether I am a good mom, or whether E is thriving--hours contemplating how we will survive the next18 years of no sleep. And, if I began to tell you about the doubt in selling two houses so that we can be out of debt, you would be bored to tears. Oh yes, I have doubted. But the point of the sermon was not the doubt, but rather what the doubt leads to. See, Thomas doubted until he could see. His doubt was not frowned upon. His doubt was rooted in a good place. He did not dwell in the doubt, and Jesus did not admonish him for the doubt. The beauty is that Jesus gives us all the room we need to ask questions and push our objections around … but He also stands ready to bless those who dare to believe. And I realized that through all the doubt in my life I have remained faithful. I have for once in my life not dwelled in, but used it to push through and challenge myself to do better, be better, live better. 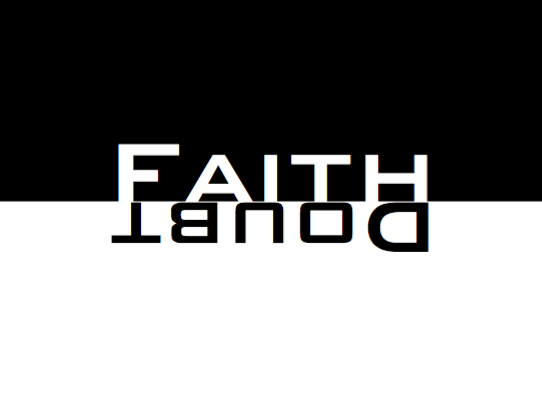 I have found there is a fine line between faith and doubt and doubt is ok. Its ok as long as you do not use it as an excuse to never move forward. So, for all of you that are doubting yourself, or a choice or anything, I challenge you to be ok with the doubt, but to move past it. Forgive yourself if you need grace, move on if you need to press forward, have faith if you are wavering.